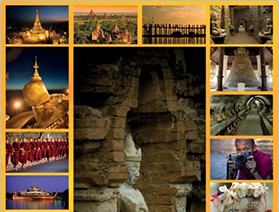 Let Myanmar Shalom show you the culturally rich city of Mandalay. The principal cultural and economic city of upper Myanmar, and former royal capital, Mandalay still evokes images of a romantic bygone era. The royal palace and its impressive surrounding gate sits at the foot of the imposing Mandalay Hill. Positioned on the banks of the mighty Ayeryarwaddy River, Mandalay lies within easy striking distance of former colonial hill stations (Maymyo), ancient cities (Ava, Amarapura, Mingun) and other cultural attractions.